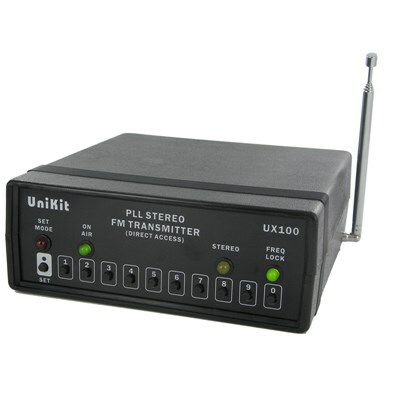 The UX100-EX is a fully synthesized high-quality FM transmitter operating in the commercial FM band (88 108 MHz). It can be used in a wide variety of applications such as special events coverage, informational and short-range transmissions, real estate talking signs, school and campus indoor radio stations, tourist information sites and fitness clubs, as well as personal computer, MP3 and car FM transmitter applications. The UX100-EX has outstanding frequency stability thanks to a Phase-Locked-Loop (PLL) crystal controlled design and offers excellent high-fidelity audio performance in both stereo and mono. It also offers direct access frequency programming allowing the operator to simply punch in the desired transmission frequency through the front panel keypad. The RF output level of the UX100-EX may exceed current requirements in your country and is only available for export. The export end user is responsible for complying with all regulatory requirements of their respective governing body.